On July 11, the indigenous Nasa of Cauca, Colombia began confronting armed groups face to face and peacefully asking them to leave Nasa territories. They removed police trenches from the urban center and disassembled homemade FARC missiles found on their lands. Four hundred Nasa members occupied and observed army soldiers on the sacred indigenous site of El Berlin outside of Toribío, where the army is protecting private cell phone company towers. On July 16, when the military had yet to retreat from indigenous lands by the proposed deadline of the previous day, the Nasa forcibly removed troops from El Berlin’s mountaintop base. Dramatic photos of the event splashed across national and international news, some featuring members of the Nasa indigenous community surrounding several soldiers, picking them up, and moving them away from their posts and others featuring crying Colombian officer Sergeant Garcia, retreating from the encampment. The municipality of Toribío in the Colombian department of Cauca has become emblematic of complexities in the war that continues to plague the country. Toribío is one of 19 indigenous communities that make up the Pueblo Nasa, the very well organized and pacifist indigenous community located in the North of Cauca. The Nasa’s ancestral lands are rich in natural resources exploited by multinationals as well as located in a strategic corridor for both illegal and legal trade, which both recently and historically have put the civilian population in the midst of the armed conflict; Toribío alone has been hit with combat over 500 times in the last ten years and the FARC guerrillas attacked 12 times in the first half of July alone. The Inter-American Commission of Human Rights has issued protective measures for the Nasa reservation. The constant threat from armed groups reached a breaking point at the start of July. After a week of intense battles between the armed forces and the FARC in the town of Toribío, all amidst the indigenous and civilian populations, the Association of Indigenous Councils of Northern Cauca (ACIN) and the Regional Indigenous Council of Cauca (CRIC) called for an end to fighting between the security forces and the FARC. They published an open letter to all armed actors, calling for them to leave the indigenous territories. The indigenous right to self-governance is constitutionally recognized in Colombia and the Nasa are protected by the Indigenous Guard, a community self-defense movement authorized by the autonomous community which holds their own internal justice processes and provides peaceful security to inhabitants. The Indigenous Guard is armed with ceremonial staffs. Under Colombian and international law, the construction of military bases within indigenous territories requires free, prior and informed consent from the community, a requirement that the Nasa claim was not respected. The letter cited displacement, injuries, death, threats, impunity, mined crops, lost crops, rapes, disrespect and disruption to civil society as a few of the reasons why the ACIN reached a point where they are calling for no more war or armed groups in the territory and an end to the invasion of their ancestral lands. 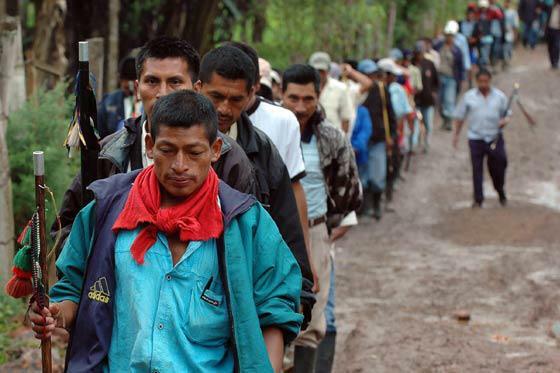 The open letter continued, “We will not stand with our arms crossed watching as they kill us and destroy our territories, communities, life, and autonomous organization,” and outlined the plan of the indigenous population to peacefully confront the different armed groups and ask them to leave until there is harmony throughout their lands. On July 14, the ACIN declared northern Cauca to be in a humanitarian emergency, citing serious effects the war is having on civilians in indigenous territories due to “constant infractions of international human rights law that both the State as well as the FARC commit.” ACIN claims that the war has escalated this year with 118 human rights violations in their territory between January 1 and June 30. It also detailed the recent mass displacement of civilians by prolonged combat in the middle of populated areas and the forced involvement of civilians in the war. Denouncing both the FARC and the armed forces, ACIN details the violence that led to the state of emergency. The statement also reaffirms the Nasa position of autonomy for their communities, reiterates the need to remove FARC blockades and trenches and armed forces encampments and bases, and urges the two main armed groups to engage in dialogue for peace. They urged the national government to recognize their right to govern themselves, as outlined in the United Nations Declaration on Human Rights for Indigenous Peoples, pointing out that far from providing security, “the army puts the civilian population at risk.” They asked that the armed groups respect the Nasa’s right to demilitarize their lands from the national police and army as well as the insurgent groups. The Nasa also expressed distress about the mass media’s coverage of the events unfolding in Cauca. “The press promotes a sentiment of racism, segregation, and intransigence for the citizens of Cauca and has slandered the good name of the CRIC as well as violated the right of the public to be well informed, a recurring situation in the Colombian press,” the CRIC said. The organization rightfully accuses the mass media of strengthening rumors and perpetuating a dangerous idea that indigenous people work with the FARC. The way the reporters frame the issues in their territories, CRIC says, paint anyone of the indigenous movement who criticizes the government as in favor of terrorism. We have seen in FOR how the stigmatization of communities in resistance to the war in Colombia can bring grave consequences, particularly when they become public opinion. We are concerned about the media coverage of the unfolding events in Cauca, particularly around the indigenous removal of military from El Berlin. According to ACIN, however, the removal of the army from their lands was not violent. They claim that 2,500 indigenous people participated in the peaceful protest and used legitimate force when six soldiers and one sergeant refused to leave. They explain that there were no individuals from either party hurt, and refuted press reports that the Nasa hit the soldiers with staffs and stones during the removal of the soldiers. They also refute accusations that they burned or destroyed material possessions of the brigade. They went on to say they “deeply regret having to use force to realize a constitutional right,” but maintain that their protest was peaceful. The military temporarily withdrew from the base, but eventually retook the facility using tear gas to disperse the protesters.? In the aftermath of this dramatic event, not only were there strong statements stigmatizing and delegitimizing the indigenous movement from the press and government, but Colombian soldiers have killed civilians in Cauca. Just days later, the armed forces shot and killed a civilian man when he ignored orders to stop at a nearby military roadblock. On July 18, army soldiers shot and killed eighteen-year-old Nasa man, Eduar Fabian Guetio Vásquez without warning while he was walking home. The commander of the Third Division of the Army was relieved of his post as a result of the second murder. The Nasa have requested that the soldiers responsible for these crimes be tried in a civilian court, but have not received an official response to this request. The sheer bravery involved in forcibly removing illegal armed groups and the national army from their territories, all in peaceful demonstration and while unarmed, speaks to just how exhausted and overwhelmed the indigenous population of Cauca is with the war ravaging the region. The continued assertion by the government that the armed forces are providing protection and their projected plans to more heavily militarize the zone in the coming weeks, despite the indigenous protest of militarization and repeated calls for peace in their region, shows the disconnect between the state and the civilian population. International political and human rights organizations such as the Colombian Support Network, Witness for Peace, and political organizations such as WOLA and LAWG have issued statements of support for the ACIN and the Toribío community residents in resistance to militarization. National human rights groups and other communities in resistance, including the Peace Community of San Jose de Apartadó, have sent letters of support. The Inter-American Commission of Human Rights has reinforced the right of the Nasa to control their lands, and human rights organizations are urging the Colombian government to respect the Nasa’s constitutional rights as well as the international law regarding the rights of civilians in conflict zones. Senator Ivan Cepeda rhetorically asked President Santos on July 25 why he opened the legislative session with a homage to Sergeant Garcia, (the commander heavily photographed in the Berlin Hill incident) and forgot to do the same for the indigenous in the region. “The indigenous are the victims and not the victimizers,” Cepeda said. The government was scheduled to sit down with Nasa indigenous leaders in the last week of July. The whole nation watched to see what would become of their meeting. This article was originally written for the Fellowship of Reconciliation USA.